Sear, brown, sauté, and slow cook all in one pot for maximum flavor with the Calphalon Digital Sauté Slow Cooker. 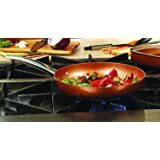 The cooking pot removes and can be placed on electric, gas, or induction cooktops to brown or sear ingredients before slow cooking. 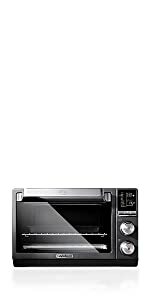 The LCD digital display provides intuitive control of multiple cooking modes, for tender pulled pork, curry chicken, paella, and more. 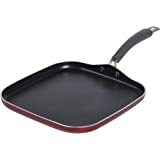 The nonstick ceramic coating is easy to clean and delivers 11x more durability* than standard nonstick surfaces, plus it’s PTFE- and PFOA-free. 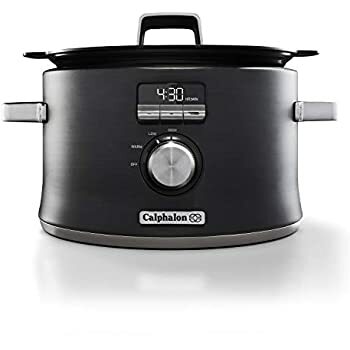 The Calphalon slow cooker is perfect for one-pot family dinners with its 5.3-quart capacity. The cooking pot is also oven safe for further heating, cooking, and warming options. Gorgeous dark stainless steel will enhance any kitchen’s countertop and metal construction provides long-lasting durability. 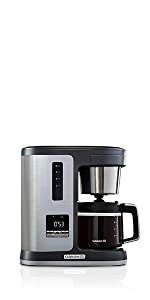 4.0 out of 5 starsGreat bean pot! 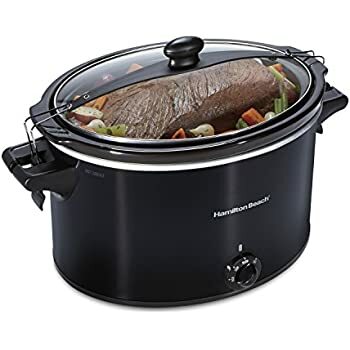 This slow cooker is round, not oval. Does it look round to you in the pictures? Not to me, so I thought that might be an important point to make. 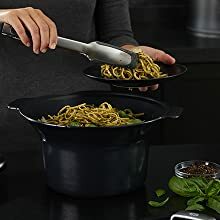 And, more importantly--to my way of thinking--the inside bottom diameter of the pot is approximately 7 3/8"- 7 1/2", depending on whether you include the slight curve up the inside wall. 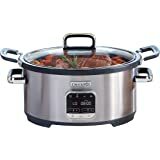 So, don't buy this pot if you want to cook a roast or chicken in your slow cooker. It won't fit unless it's really a small cut of meat. Hey, this won't even fit two leg quarters flat in the bottom, so that should give you an idea of the size of this. The side walls come up kind of straight for about 4 1/2", then--for some very odd reason--it flairs out, so that the top inside diameter is an ample 10". 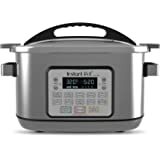 And that is why I say it is an ideal bean pot; soup, casserole-type dishes, potatoes, meatballs, sausage, deserts, too. 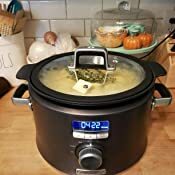 One nice feature of this slow cooker is that the insert can be used on your cook top. 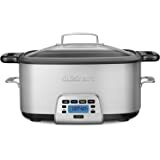 So you can brown ingredients or boil beans, or you can even heat up all your ingredients to give the slow cooker a head start before turning it on. The insert is suitable for an induction plate or cook top, which is why I decided to order "another?!" slow cooker. 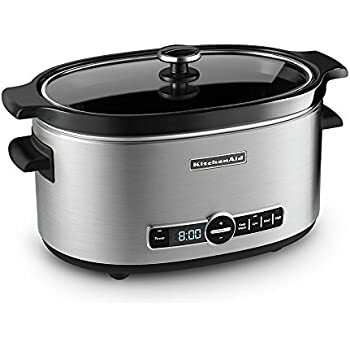 I have too many slow cookers, but this one works fine on my induction cook top. The insert has a bottom that is very similar to what you see on Analon and Circulon Induction cookware. Analon and Circulon bottoms tend to scratch my ceramic/glass cook top, so I put paper towels between the cookware and the cook top to prevent that from happening. I've done that with this insert, too. The flat, outside bottom of this insert (that would make contact with your induction element) is 6 1/2" exactly. 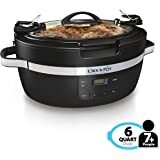 With the small size of the inside bottom, you will be able to saute' onions, a mirepoix or 'holy trinity', carrots, garlic, ground meats, meatballs, chunks of meat and smaller cuts of chicken. But it's going to be cramped in there, and to get good browning instead of steaming, you might want to consider going in batches. Another great feature: It has a glass lid! And the glass lid has a rubbery gasket around its circumference! The lid stays in place, does not shift around, and holds in the steam. And, maybe that is the reason for the odd flare-out of the upper side wall. The condensation easily runs back down into the pot. 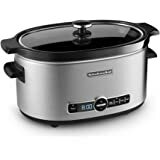 The slow cooker works well, but (unlike some Cuisinart slow cookers) it only has a high and low setting. 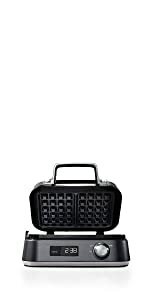 It is light weight and very attractive with its outer shape, style and color. 4.0 out of 5 starsVery nice, but pricey! 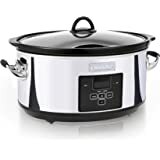 We have been cooking with a "slow cooker" or we refer to it as another brand name slow cooker that has sort of become the standardized name for slow cookers now - kind of like how people ask for a Kleenex when they want a tissue. First, it is nice that this is induction and gas cooking options. If you own an induction stove top, then that becomes a very important and nice feature. If you, like me, are cooking with gas, again it can be nice. We cook a LOT with the slow cooker. 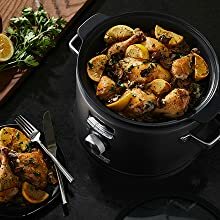 If you aren't familiar with slow cookers, there are a lot of good recipes that are easy, healthy and tasty. Plus, your whole house smells delicious after eight hours of simmering a delicious recipe in your kitchen. But sometimes the slow cooker recipes start to all taste, and more noticeably, FEEL the same way. There is no browning the outside, or any other type of cooking except a long, slow simmer that breaks everything down into a mush of good flavor, but very little texture. 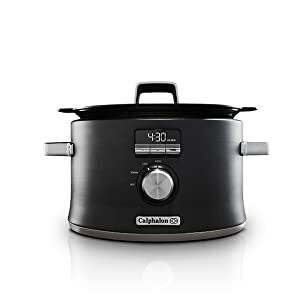 With the Calphalon Digital Saute Slow Cooker, you can easily use your gas or induction stovetop to brown the outside of the meat before slow cooking it all day long. You can use the different menu items and recipes to start right off with some nice recipes. 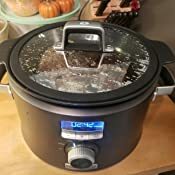 We love using the slow cooker for roast. The roast is SO MUCH better if you brown the outsides of the roast before slow cooking it. 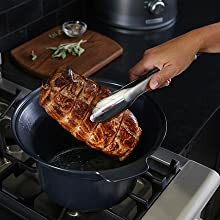 In the past, I would have to brown the roasts in a pan, then switch it over to the Slow Cooker. 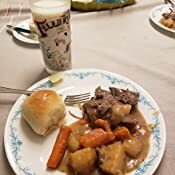 Now I can just brown the roast in the slow cooker pot, then put the pot into the Slow Cooker base and simply finish the recipe and we end up with a great, intact, browned roast that is soft and tender - while still having texture and flavor. 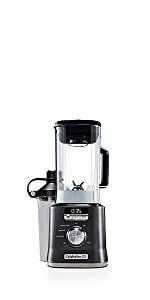 So, is the Calphalon worth the nearly $120 price difference for the average person? Probably not. 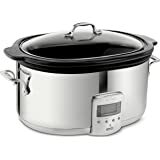 But if you are a foodie, or if you are tired of the same old slow cooker recipes and you can afford the difference, then yes - the Calphalon Slow Cooker offers benefits over the traditional slow cooker that make it worth buying. Also, it looks nice. 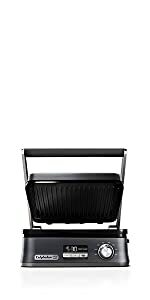 If you have spent a great deal of money on your kitchen with range hood and nice stove top and cabinetry and you want your cooker to look like another high end piece of your kitchen ware, then this looks like a million bucks, or at least $100! 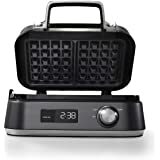 I would say this is a five star cooker, with one star removed for the upper echelon pricing, making it a slight bit less of a bargain or value. 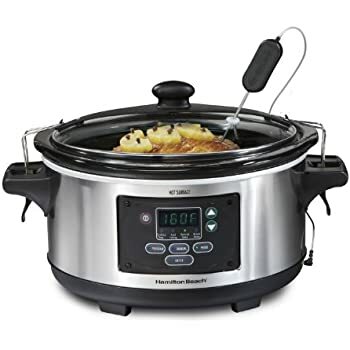 But for the "money is no object" household who want the best utensils and tools to cook, this is a great slow cooker! Product misleading. The acute function is done on your stove top. 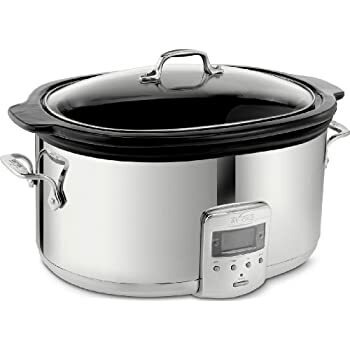 Just a regular slow cooker. 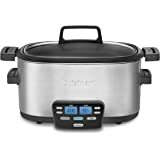 5.0 out of 5 starsTHE BEST slow cooker ever, size is perfect amazon price is WOW. 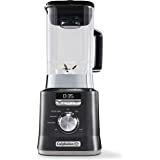 I started by reading Consumer Reports, which I do not trust much anymore, followed by reading Amazon reviews on brands and models recommended by Consumer Reports. 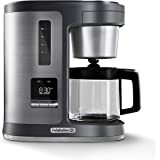 Not surprisingly, many of the ones recommended by Consumer Reports did NOT have high ratings in Amazon. 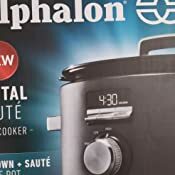 I chose the Calphalon Digital Sauté Slow Cooker because it is the only slow cooker which gets great Amazon reviews about its temperature accuracy, ease of use, and attractive looks. 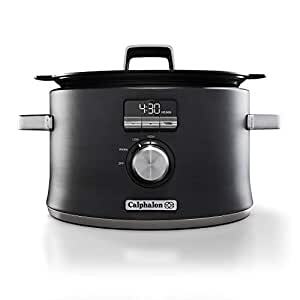 You will not regret buying the Calphalon slow cooker. 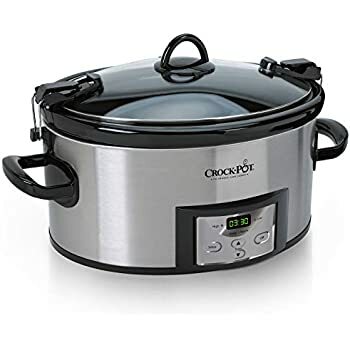 The saute-in-the-crock feature is one of the main reasons I purchased this crock pot, and it does seem to work well. 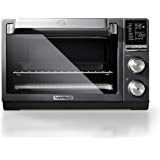 I like everything about this appliance, except I wish the heat control wasn't necessarily tied to the cooking timer. 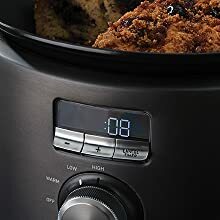 The timer is great, and a good feature, but I'm used to setting a temperature level, and just checking it when I feel it's done, not estimating when that time will be. But it's super easy to adjust the time. 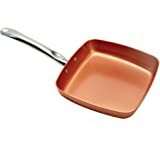 I like the non-stick interior, you just have to be careful about not using metal implements. 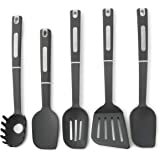 It was a good excuse for me to buy silicone tongs.